You won’t believe what my 10 year old said about consent! Consent is a recurring topic in our house. I talk to my kids about it – and apparently I don’t do so bad. I was in the car with the kids a couple of weeks ago and we talked about the Jesus story. We live in a pretty catholic country and I know the kids will be bombarded with stories about baby Jesus and Mary and (for reasons that are completely inexplicable to me) the little donkey. Among other places, they hear that stuff at school, too. And while I could probably file a lawsuit, I don’t wish to do so for several reasons. I do not want to be “That Mom”, and I simply don’t have the time for stuff like that. So, I decided to bite the bullet and talk about Jesus – in about the same tone I would talk about other fairy tales. My kids are very interested in the whole thing – The Ninja is currently into greek gods, so the concept of goods impregnating beautiful young women isn’t totally alien to him. But I notice him squirming while I talk and ask him what’s wrong. 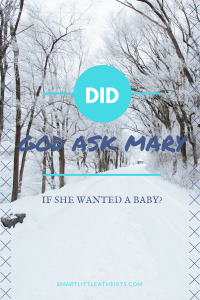 “Mom, did god ask Mary if she wanted to have a baby?” I told him that he didn’t (at least I don’t think it is mentioned in the bible…) and he says, with a certain conviction, “then he isn’t a good, loving god”. My ten year old wants to know if the christian god asked for Marys consent. And while we have so many parenting fails in our lives as Moms and Dads, its the little things like this that give us hope – Apparently the talks about consent resonated with him. And that is a good thing. It is absolutely hillarious to see them scramble for an answer. If they come with phrases like “Mary knew it was an honor”, I mention the greek gods. They love that! So, your mission (should you choose to accept it) is this: Go forth and ask some christians about god, consent and the virgin Mary… and please, Please, PLEASE let me know how it went!